Just a quick update to let everyone know that I had my sutures removed yesterday. I was told that my wound looked really good and some of the medical staff even seemed impressed. I don’t know what we did, but I won’t turn down a compliment. I was also fitted with a “shrinker” over Short Round. Basically it is a sock that fits over Short Round and gently compresses the leg. I was also taught how to gently massage my limb which supposedly helps with phantom pains. After the appointment, I massaged my limb all afternoon and it actually did help. And when I woke up this morning, I had much less pain. So I think it’s working. I’m sure there are more days of rolling pin sensations ahead, but I’m going to take my glass half full and say there is a light at the end of the tunnel. Next Tuesday we start chemo – two rounds of three weeks each. My understanding is I’ll get my infusion on Tuesday, then allow it to work it’s magic for three weeks, then do it all over again. In addition to shrinking the tumor cells on my lungs and pelvis bone, the medicine will also degrade my immune system and some intestinal cells. I should also lose my hair in this first round. Pics will, of course be posted! After the first three weeks, my body will have had time to regenerate and strengthen enough to start the second round. After the second round, we will do body imaging to determine if the cancer is responding to the chemo and if tumors are shrinking. If so, then we may continue the treatment. If not, we will discuss other medicines or options with our oncologist. I’ve detected yet another secret weapon that cancer possesses to break down its host – the capability to induce pain during laughter. If I laugh at something, I usually have more phantom pains. It actually makes sense. Taking away the desire to laugh more quickly breaks the positive and encouraging spirit of the host, which more rapidly leads cancer’s ultimate goal – to endure and thrive at the expense of a living organism. All things being equal, military units are similar – well-disciplined and highly motivated units tend to achieve more success than those that have low morale. So, while it lifts me emotionally, laughing sometimes brings more pain and discomfort. But just being aware that cancer wants me to stop laughing increases my resistance to this disease. If I want to laugh at something, I’m going to suffer through the pain. It’s my way of telling cancer that it’s going to take a lot more than laughing pain to make me stop laughing. I won’t allow it to secretly break my spirit. Along those lines, I received a package this week that made me laugh really hard. 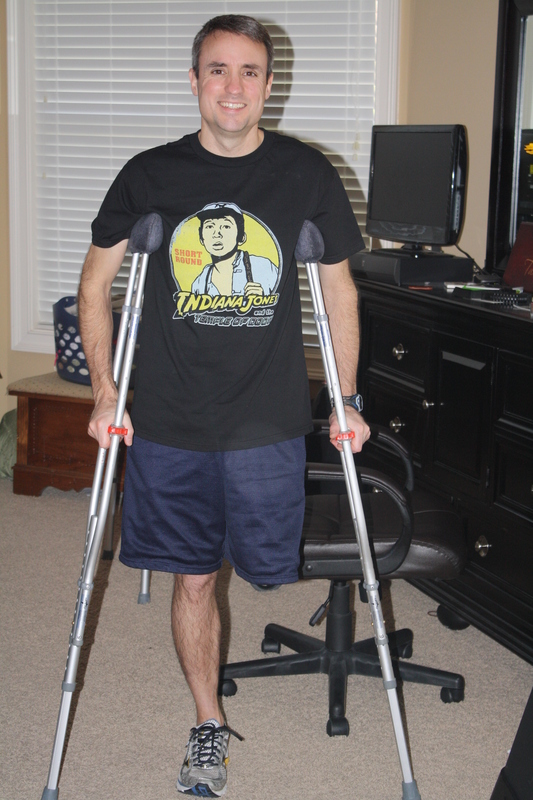 The pics below show a shirt that came in the mail from Rhonda and Shane Sullivan. For their efforts in finding it, I am truly humbled and appreciative. Thank you both for the lift me up, as well as the accompanying pain! In my honor, Jenn will be wearing the shirt in a 5K Turkey Trot near our house. Thanks Sweet! And Happy Thanksgiving everyone! I’m still pretty much laid up in bed and I won’t lie, there has been a significant amount of pain. The phantom pains are not letting up. I thought they had subsided a little, but they returned with all their phantomness and a little more. When I was in middle school, our mascot was a Phantom. Maybe it was a foreshadow? Describing the phantom pain is both fascinating and disheartening. When it is really bad, I have sharp pain in my index and middle toes on my non-existent foot. Those have been around for a while. My left lower leg feels like it is tied around my thigh and someone is pushing on the sole of my foot with a rolling pin. I also experienced a new pain yesterday – a Charlie horse in my left calf (the non-existent one.) Whoo-hoo! That was fun! I’ve read stories and blogs of unfortunate folks whose pain persisted for years. For me and my family, I certainly hope that is not the case. I am communicating this not just to whine, but also to convey what an amputee might go through after surgery especially the phantom pain. Disrupted sleep also becomes the new normal. I wake up several times a night and take meds. But I’m realizing something else with all this pain. This is really the first time in my life that I’ve had to deal with significant pain on a daily basis for a long period of time. Pain management includes of course lots of pills. But for me it also includes meditation. Through meditation, I am able to control my mind and put it in another place – in a past memory, in something my imagination generates, or at work. I can put my mind almost anywhere. And remarkably that takes the phantom pains away. It’s not long lasting and only persists as long as I’m meditating. But it is a powerful weapon against pain. I can live with the pain, as long as I know that eventually it’s going to diminish. I think most of us fear the idea of pain more than the actual pain itself which generates stress and anxiety. Most of us have heard the saying that pain is just weakness leaving the body. That may be true of folks who are attempting to better themselves through exercise, but long term, chronic pain is a lot of weakness leaving the body! And I’m not seeing the benefits of exercise once this pain is gone. I started meditating last December to learn how to relax and reduce stress a little more than just vegging in front of the TV. I read a short book (Mindfulness in Plain English by Bhante Gunaratana. $10 on Amazon) that outlined the basics and also explained what meditation is and isn’t. I told myself I would do it for a month, 30 minutes a day and just see if it had any impact. After the first two weeks I could already detect a difference in my relaxation abilities and after a month I was hooked. I even splurged for a meditation cushion that Jenn refers to as my tuffet! I have pretty much kept the same routine of 30 minutes a day, when I can, since December and have seen astonishing results. Meditation allows me to relax, but more importantly, it allows me to suppress the “monkey mind” or “mind chatter” that use to plague my thoughts through the day. It increases my mindfulness, which is the ability to separate myself from life experiences and see the experience with a detached objectivity. It allows me to separate important thoughts from the not-so-important ones. It has given me the knowledge and skill of how to truly live life in the moment and to see the incredible beauty of everyday objects and experiences. It also has allowed me to powerfully recall suppressed memories and life experiences, both good and bad, from childhood and adulthood, and then cope with those memories if needed in a healthy manner. Meditation has increased my empathy and compassion, patience and peace and has filled a void that I was unaware needed filling. Before meditation, I certainly would not have labeled myself as a lost soul. Life was wonderful and I was very happy and would not have complained about too much. Meditation just gave me a tool that prioritized my life in an unexpected manner. I’m certainly no expert and haven’t started ordering my Buddhist monk robes yet, but it is something that has allowed me to see, and more importantly cope with reality in a simple and effective manner. When the reality of cancer entered my life, I truly believe that my ability to see the truth of it, accept it, and quickly begin to deal with it can be attributed to the skills that meditation taught me. It’s like anything though. There are good meditation days and bad meditation days. But the overall benefits that accumulate through daily practice changed my life in so many positive ways. If you would like to know more about it, please let me know and I’ll probably go on and on! My physical therapist came by twice this week. She showed me exercises that help strengthen Short Round to prepare for a prosthetic and also prevent my hip flexor from tightening from too much bed rest. She forewarned me to take my pain medication an hour prior to her arrival – not exactly what I wanted to hear. In the end though, the exercises weren’t too bad and helped me move around a bit more. I’m glad the physical therapy has started. I wasn’t sure how much movement I should be doing with Short Round. In addition to the wound closure, there are sutures inside as well. I don’t want to disturb them too much. So when the therpist said I could walk around on crutches, lift Short Round and basically do all types of exercises, it was as if she gave me permission to move and I went to town. Probably too much that first day though. My leg was in a lot of pain that night. I’ve attempted to discern the pattern of what generates the phantom pains. I think basically the more I move my leg early in the day the more it will hurt that night. For Thanksgiving, my sister and her two daughters are coming up this week to join my folks who are still here helping out. The boys can’t wait to see their cousins. I have two appointments this week – one to remove the stitches and the other to get blood drawn and see if my heart is strong enough to start chemo after Thanksgiving. Because of the full support of several visitors, but more importantly the boys and their wonderful, child attitudes, our home is still overflowing with positivity and hope as we transition into the next part of this experience – chemo. Thank you everyone for your continued support, prayers and thoughts! P.S. I have to include this experience from last night. My beautiful, supportive, and caring wife was double checking my nightstand last night to ensure I had all the necessary equipment, water, and medication to make it through the night. I told Jenn I was looking forward to watching “Amadeus” and being distracted for a few hours. Jenn smiled lovingly, bent over to kiss my forehead, and whispered, “You sure you don’t want to watch “My Left Foot?”, then laughed her way out of the room. I love her. Jenn drove me home from the hospital on Saturday. Before we left, we actually had time to ourselves for a couple of hours while waiting on the release order. We talked at length about one of the more frightening aspects of this whole ordeal: me dying sooner rather than later. I still don’t even want to assign actual numbers to the abstract terms “sooner and later.” I’ve mentioned it a couple of times in the blog, but Jenn and I had not really sat and talked about it. I know we still have a long journey full of scans, diagnoses, difficulty reading doctors’ faces, fear and relief. But, while it’s not easy, Jenn and I believe that simply talking about difficult issues diminishes their ability to instill trepidation in us. What’s going on in Jenn’s head about an issue is usually much different than what’s going on in mine. It’s no different for a cancer diagnosis. And if one of the goals is to reduce distress and chaos throughout this, we need to know what the other person is thinking. Getting the issue out of our own heads, where the actual problems related to the issue are often magnified and distorted from the facts, into the open is always helpful for us. It’s never easy, but the end result is usually relief and much less stress. We seized the opportunity. It was hard but we did it. We cried…again a lot. We hugged hard. Obviously it’s not something that anyone wants to put thought to, but our hand has been forced. And, like all issues that need resolving, this one did not seem as upsetting after we talked about it, honestly, openly without holding anything back. The pain level in Short Round has significantly increased over the last few days. The phantom pains seem to be leveling off, but now pain in the limb itself is apparent. One of the tools for pain that the doctors used was two catheters running on the inside and outside of Short Round respectively. The catheters were steadily delivering some sort of nerve block solution to two primary nerves. Unfortunately, I had to remove them on Sunday and it was then I realized just how well they were working! There is a lot of pain now. If I keep Short Round immobilized it’s not too bad. But if I get up and move around, I can feel everything shifting inside and it’s painful. I didn’t feel this with the nerve block, which explains my successful laps on the walker/hopper around the hospital. Now, I’m having trouble watching anything funny on television because laughing hurts too much! However, this too shall pass. I love being around my family. My boys are nothing but energy and fun, but sometimes giving them enough attention is exhausting. My folks are still here to help with everything from laundry to making meals to just being around the children when I’ve had enough. My days now consist of lying in bed either watching television or reading and just letting the healing happen. If you have experienced this lifestyle or know someone who has, it’s not easy. Our society has evolved to a point where simply lying around is not easy. There is always something to distract from being bored or someone to talk to. I want to just get up and walk/hop around the house. Unfortunately, doing that seems to aggravate Short Round and I need to quickly lie down again. I’m also realizing everyday tasks that I once had control over are now not completely mine anymore. After a long day of lying in bed yesterday, and a restless night’s sleep, I wanted to shave this morning. But I didn’t just want to shave. I wanted to exhibit just a little autonomy in this helpless situation. Jenn could have easily assisted me with it, but I needed to feel that I could something with just a bit of significance by myself. I hopped into the bathroom with my walker/hopper and sat sideways in front of the sink. I should have inventoried what I needed because I couldn’t reach anything and didn’t want to get back up to retrieve them. Luckily my 3 year old was around to gather materials for me that were once out of the conscious region of my thinking process. I do feel somewhat fortunate in the thought that this is temporary. Once I’m vertical again with my prosthesis, I can push thinking effort back to the subconscious so I don’t have to think about shaving again. I can just do it. After I finished my little victory (yes, still with the aid of my son), I got up on my walker/hopper to shuffle back to bed. Catching myself in the mirror, I noticed Short Round, wrapped up and kind of just dangling there. It took me by surprise again, my missing leg. It’s gone. I see it not with sadness and what I’m missing, but as my new reality. My new normal, as a friend quoted on the blog. My new normal won’t consist of the pain and discomfort that accompanies healing. It will be getting up at 3 AM to use the bathroom and cursing because the boys misplaced my leg. It will be a hurried feeling in the house as I search for my running leg to get in a run before work. It will be sitting on the couch with Jenn, after the boys are asleep, watching Dexter, and not even thinking about my leg. It will be taking the boys to the playground. The new normal is a goal well worth whatever I have faced or am going to face. Things have settled down a little bit since I first started this blog. I’m going to take a break for the next week or so and just allow more healing. Since not much will be happening until I get back to the doctor (Nov 20th to get stitches out, and 21st starts physical therapy), I may be somewhat idle. However, please don’t hesitate to post or to ask me any questions. I did not anticipate the incredible amount of support and love and that has been flowing from the comments on this blog. I’ll reiterate how humbling and uplifting they are. While waiting to go into surgery, I read through all the posts knowing that an unexpectedly large cohort of friends and family were pulling for me, selflessly taking some of your own time to pray, think, and send out positive energy. I closed my eyes for a few moments to imagine it as some type of network, interconnected to help one person. And in those moments, I realized more folks than just me were (and still are) helped. I have to believe that, while directed toward my current situation, reading through all those eloquent (and sometimes a bit too revealing!) posts that ideas were generated or thoughts arose in other folks as a reminder to call mom or dad, to check on the kids, to be a little nicer, or to just appreciate their current life situations. Believing that one person is unknowingly helping another personally brings me peace, mindfulness and patience in this chaotic time. Regarding everyone’s responses, please allow me time to respond accordingly. I realize that several of you will not require a response from me and thank you for that consideration. However, I don’t think the blog is at a tipping point where there are too many posts for me to handle. I’ll play that by ear. But right now, responding to these inspirational and nostalgic prayers/stories/memories is important for me even if it’s just a thank you. I want to and do not feel it’s an obligation. At this point in this life-changing journey, establishing connections and communication is healthy, therapeutic and healing. And I have to set the record straight on some of them! We are fortunate to have the neighbors that we do. We have only lived in our current house for 15 months, but from day one, our community has welcomed and treated us like 20 year friends; just such a good group of folks. The night before surgery, a few of them dropped by to express their sympathy, talk, and have a group prayer. It was just really nice. Unfortunately, I think I was upright a little too long and the tumor either was shifting or had grown some after the biopsy, but regardless of the reasons, the word ready did not describe how much I wanted my leg separated from me. It just hurt and lasted through the night. So when I woke in recovery looked down and saw my leg was missing, I was beaming like the Cheshire Cat. No more tumor pain! I realize there is more pain ahead, but it is recovery pain and is much more tolerable. The doctor informed us that the tumor had grown a bit more toward my knee and she believed that I was in for an even more world of hurt had we not amputated. That was reassuring. While I was in surgery they also implanted my chemotherapy port which significantly speeds the chemo process when we begin. Nice. Two birds with one stone. It was a good day! I’m not sure how it happened but somehow I scored my own room, which is actually quite large. Yesterday, I had several visitors. My folks are up for the fun and to help with the boys. Of course Jenn was here. And many colleagues also took time away from their own lives to see me. They brought a lot of food; critical for overnight stays at hospitals. Having visitors in and out yesterday helped me shift my focus from the pain to being a part of their lives for a few moments. At one point, we had eight people in the room and while everyone was chatting, a physical therapist came in and informed me that I needed to attempt to “walk” around on a walker. There was an awkward silence as people weren’t sure to stay or leave. I decided I needed all the support I can get. So, uncomfortable or not, several friends and family were a part of my first steps as an amputee. It was perfect. Not wanting to fall in front of my support team was an excellent incentive to succeed. The walk went fine (although I think for one-legged folks it should be called a hopper, not a walker). But what was even more satisfying was watching people sharing their lives with strangers and enjoying time out of their schedule to get to know someone else. This experience is bringing people together in unimaginable ways. Through both the blog posts and the visits I’m receiving, I think several people, including me, are realizing the positive results of what was originally a negative circumstance. I believe this is one of the best ways to beat this thing. I certainly haven’t thrown in the towel yet and plan on being around for a long, long time, but if I do succumb sooner rather than later, the radiant positivity and lighthearted atmosphere that has been generated (and so much more to come) will be the ultimate win. Right now, I’m experiencing phantom pain, which is believed to result from the brain slowly turning off the neuronal pain pathways after a limb separation. It’s really bizarre. I’m physically sitting up right now, looking at my missing leg, knowing it’s not there, but feeling sensation and pain from it. It feels like my leg is bent at a right angle going through the bed. When I try to wiggle my toes, it feels like my leg is paralyzed. And I can feel pressure on the bottom of my foot like it’s sitting on the floor. Occasionally, there is pain, but again, it’s pain in the recovery category, so mentally it’s much easier to handle. I have a lot of pain meds too, so life is good! I’m not particularly fond of the term “stump.” It’s a bit too brutal and makes me think of trees. 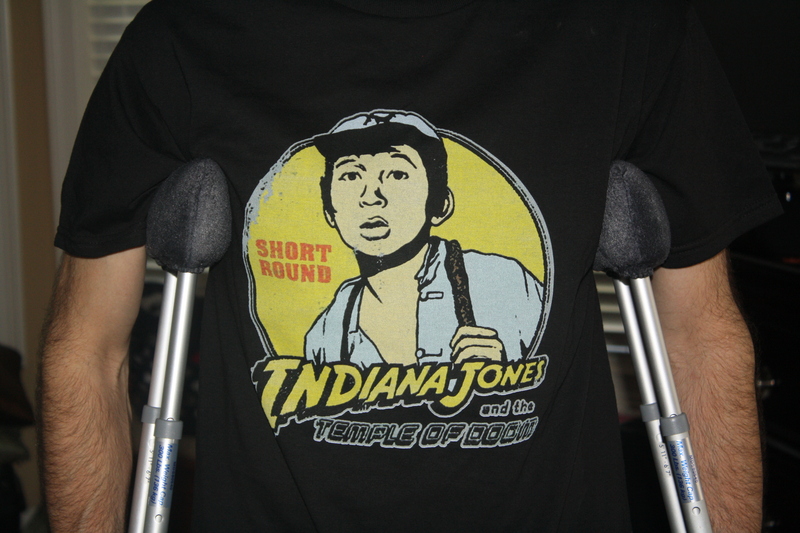 So I’ve renamed my stump to Short Round, after the character in the second Indiana Jones movie. I think it is much more fitting. I also want to document just how much Jenn has been a positive influence through all of this. The whole situation is unfair for her in more ways than just me. This is not Jenn’s first experience with cancer. Her mother unfortunately passed away when she was 48 from a rare cancer and Jenn was only 20. When this all first started, I wondered how she was going to cope. I can only describe her contributions as nothing less than remarkable. The easy road for her would have been to shut down. But I have basically put my life in her hands and feel the strength of character and motherly love when I hold her. I could not have the attitude that I do without her support and smile. I love my boys and know they are well cared for throughout all this. I love her more than anything and am just reassured when she is near. Thanks Sweet! Hi all- Jenn here with a quick update about today. Hunter’s surgery went smoothly, and we were just moved to his room. He’s pretty drugged up, and while its very tempting to record him, I’m just going to enjoy the little Hunter-isms all myself:) I know he will be posting information in much greater detail over the coming days. I can’t express enough how overwhelmed we are by the love and support we have received from those near and far. It’s so comforting to know that we’re not alone in this. I too look forward to his next update here, as his great strength and positive attitude has greatly helped me in accepting all of this, too. I’m off to fetch him some Chinese food since he hasn’t eaten since 10pm last night. Know that he’s well taken care of, and is looking forward to updating soon. I know several of you have been waiting for the results and you probably realize that since we didn’t immediately jump for joy and send texts and emails, it wasn’t good news. We saw my doctors yesterday and I’m afraid the results fall into the really BAD news day category. Unfortunately, the PET/CT scan showed the tumor is metastatic and has spread to my lungs as well as some in my pelvis bone. And the worst news is that it is incurable. Chemotherapy will be used to treat and manage symptoms as they arise. I was sort of expecting the lung spread because of symptoms that I’d experienced at home this week: some shortness of breath and coughing up a little blood. But the incurable part is tough to digest. It is quite shocking and we are still letting it sink in. I realize a lot of people wanted to know the results, and I wanted to post them rather quickly. Right now I’m not quite sure how I’m going to process this. I do know that in the next few days and weeks we will go through a roller coaster of emotions that will equate to being in the back car of the Scream Machine at Six Flags. We have already and will continue to cry…a lot. The thought of my boys and wife not having me around is beyond sadness and I can’t begin to imagine it without losing complete control and tears welling. Crying is not held back here, especially lately. We will get angry, but that probably won’t last long. Anger rarely helps solve problems. We will question the fairness of all this. But, given that I now have a countdown clock with unknown numbers above my head, any time wallowing “why me” is not well spent. We will also laugh some more. Regardless of how dire the situation, laughter and positivity will continue to be an essential coping mechanism for us. I hope, through this blog, to continue to make fun of this bully all the way to the end. No matter how much time I have left on this earth, cancer will win if I allow it to transform me, to depress me, or to take away any of my spirit. The amputation is still on schedule for Wednesday. My leg has grown quite painful and I’m at the point of just wanting to get rid of it. I will begin chemo to treat the metastasis after Thanksgiving. For those who may be unfamiliar, chemotherapy is basically a regimen of drugs that are designed to target and destroy cells that grow more rapidly than other human cells. Cancer cells fall into that category. So the drug will hopefully shrink the lesions in my lungs and bone and leave the rest of my body alone, except for hair follicles and intestinal cells which also grow rapidly. That’s why during chemotherapy patients lose their hair and experience nausea. I’ll probably be nice and hairless by Christmas, just when I found a good local barber. Hats may be on the Christmas list this year. More to follow, but I wanted to get the results out. Thank you to everyone again for all the support and posts. Your prayers and thoughts are incredibly encouraging and uplifting. It’s only been three posts so far, but this blog is turning out to be extremely therapeutic for my family and me and the support it has generated is humbling and overwhelming.